Successfully Added TV Box COOWELL V11RK - Kodi, Android, Quad Core CPU, 2GB RAM, SPDIF, 3x USB, DLNA to your Shopping Cart. 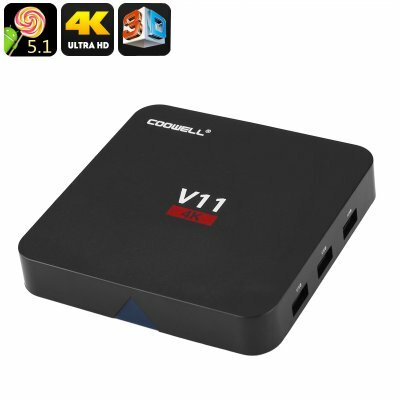 The Coolwell V11 RK TV box is a mini TV box that can fit in your hand and comes at an incredibly low price. It's certainly one for the barging hunters out there as if offer 4K video outputs and a stunning quad core performance at a cheap price. Add up to 32GB of additional storage with the micro SD card and you will have room for all your games, movies and music library on this mini TV box. What's more at under 100 grams and measuring only 10x10x2 centimeters this TV box is easy to take with you anywhere and will fit in your pocket or bag. So you can take it on holiday and needed worry about entertaining the kids on a rainy day. The COOWELL V11RK Android TV box comes with 12 months warranty, brought to you by the leader in electronic devices as well as wholesale TV boxes and home theater systems..